Enjoy a tankard of ale in an authentic English pub and stroll the streets of the United Kingdom. The shops and restaurants here convey a whimsical feel of the UK. The courtyard features a stage where the British Revolution, a live musical act, performs daily. Surrounding the stage is a hedge maze, a fun diversion for kids. 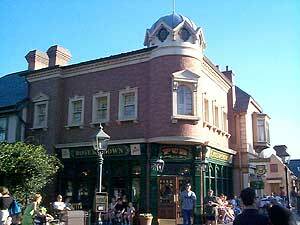 The streets of the UK pavilion are modeled after Cherry Tree Lane, the residence of the Banks family in the Walt Disney classic, Mary Poppins. 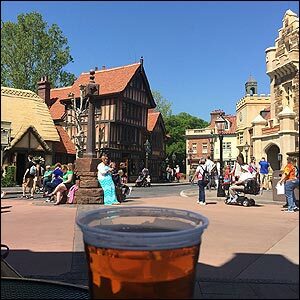 The Rose and Crown Pub & Dining Room features authentic English fare and one of the prettiest views of the World Showcase lagoon. This spot is touted by INTERCOT regulars as one of the best to watch Illuminations! Reservations are hard to come by, so be sure to book early. Next door, the Yorkshire County Fish Shop serves up fish & chips to go. Outside, get your Guinness, Bass, Harp, or Strongbow cider from the Beer Cart. Click below for menus!